Americans work hard, which is great. But the data shows that many of us think that means we should leave vacation time unused which is a loss for you and your family. It is also means lost productivity and less job satisfaction, which is bad news for employers. Today on Destination on the left, Katie Denis and Nicole talk about what gets left on the table and what to do about it. People are losing out on travel and enriching their lives – and the travel industry is losing real dollars. Katie is responsible for the strategic direction and day-to-day management of Project: Time Off. She is also responsible for taking all of her vacation time and encouraging her team to do the same. It is her favorite duty. She spends her time off with her toes in the sand of Grayton Beach, Florida, hiking the Colorado Mountains, or returning home to Cincinnati, Ohio. Katie lives in Alexandria, Virginia with her husband and their two daughters. Thank you for joining me, Katie. I love your bio because it’s all about taking time off. Which is something that I’m sure most of us do not do enough of? I’m really interested in learning about Project: Time Off, the successes, and what’s in store for the future. Before we get started, can you tell us a little bit more about your story in your own words? Sure. I think one of the reasons my bio is so focused on vacation is, one, it’s on-brand, but two, it’s a big reason for why I ended up in this job in the first place. I was sitting at my desk and I got a picture texted to me of my daughter dressed up in her Halloween costume. It was her little elephant costume, so it literally started with an elephant in the room. She looked so cute, her little fat face coming through. She was only six months old. I got that picture on my phone because I wasn’t there because I didn’t think it was important enough to ask for the morning off to go to her Halloween parade. That was kind of a moment. When I got that picture, it was like, “You know what? This isn’t the kind of mom I want to be.” I’m uncomfortable with the fact that I’m not there. More uncomfortable than having to ask for that time. I knew it was time to make a change. This wasn’t right. This isn’t the kind of parent I want to be. This isn’t the kind of parents I grew up with, frankly. I mean, even my dad, who worked crazy hours when we were growing up, always made time for vacations. It was something we could count on. I wanted to make sure my kids could count on that time too. That’s really awesome. I love how you called it, it was literally the elephant in the room. That’s such a great visual. By the way, I’m the mother of four daughters, so I can certainly relate to those moments when you have to make those choices between some sort of a work or professional obligation over something that you want to do with your children. I can totally relate. I’m really excited to hear how Project: Time Off. Where did it start? How did that evolve? It started before I got here and it was all about the benefits of travel. We think travel is good for you. We think travel is good for your health and your relationships. There have been a lot of studies done on that. No big surprise, but travel is good for your health and your relationships. I guess the thing that was tough was it wasn’t a surprise for the people that we told about it. “Oh yeah, it’s good for you.” They were like, “Yeah, we know. We want to do it. That’s not the problem.” We pivoted to understanding what that problem is so we could diagnose it. What changed Project: Time Off regarding its scope was working to understand what is stopping people from taking vacations. What is the origin point of this is, so we can tell them, “Hey, travel is the solution to this.” We do believe that that’s the case. But then when we look at people leaving time on the table, we have more than half of Americans, pretty consistently, leaving vacation time on the table. There’s a disconnect. A lot of that has to do with our lack of communication at work. It’s not that people are negative about vacation, their own or other people’s. It’s that we have developed this culture of silence where most people don’t hear much about vacation. In that silence, nature abhors a vacuum. We pack that vacuum with all of our anxieties and insecurities. We just err on the side of caution because we’re afraid. We just don’t know what the outcomes are going to be. We need to open up a conversation about this. 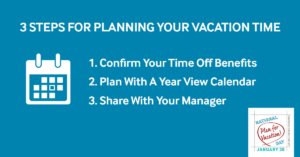 First of all, employees would be shocked at how positive managers are about vacation time. I think managers would be surprised to realize that, while they might be positive, they’re not setting a great example. They’re not being mindful in the way they behave. What we’re really trying to do is shed light on where these disconnects are, how to solve for them, and then ideally, tell people, you need to travel with that time. You need to get out and see things because that benefits your company just as much. Getting a new perspective, enhancing your creativity, checking out another city, another culture. There are so many things you can do that will inspire you and will make you better for your job, not worse for it. I think that’s such a great point. Of course, I always feel like I’m biased because I work in travel and tourism. It is the truth that when you do get out there and travel and have these new experiences, it does so much for you. Motivation and inspiration, and as you said, enhancing creativity are definitely part of the mix and benefits of it. 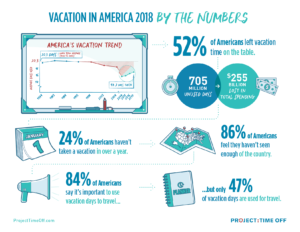 I want to back up, though, because you were doing research and finding out that basically perceptions of vacation and Americans are like, “Yeah, it’s good. I know it’s good.” But when you dug deep, how did you get that deep? Was there research done? How did you get to the point where you figured out that there’s this culture of silence? Can you describe that a little bit more? Yes. We did a lot of research. Every year we survey many thousands of people to take the temperature on what’s stopping them from using their vacation time. We want to make sure we’re highlighting those barriers to help them overcome it. To shed a light on it. I think putting it forward, especially to workplaces, that they understand this is a solvable problem. On top of that, if you can solve for that problem, places with positive vacation cultures have higher retention, higher rates of happiness, lower rates of stress. This is all stuff the affects your bottom line tremendously. I think really just trying to shed a light on that is what we’re attempting here. We looked back. We went back to 1978, which was the earliest they started measuring some of these data points and found that from 1978 to 2000 the long-term average vacation time was 20.3 days and then in 2000 we just started tanking. We dropped down to like 16.0, losing almost a full workweek in 2014. That was our low point. The past three years we’ve seen increases, which are good, but we’re still a far cry from that long-term average. Things have changed markedly in a relatively short amount of time, less than 20 years. When you start thinking about those timeframes, what are the things that have changed within that? The people who are adults now that might not be taking their vacation, what are their memories of being kids piling in the station wagon going on the road trip that they’re not doing for their own families. What are the downstream consequences of that? One of my favorite studies we ever did was with kids. We surveyed kids aged 8 to 14. My favorite thing about surveying kids is they are brutally honest. I have a fundamental belief that in many surveys people are liars. I think when someone asks you a question you want to put the best version of yourself forward. You have a little bit more of a check. So, “Yeah, I work out five times a week.” “I floss daily.” All those things. Everyone’s marriage is perfect. You start negotiating. You’re like, “Are you happy?” You’re like, “I’m pretty happy … I have a pretty good life. I’m gonna put ‘extremely happy.’” You just kind of negotiate with yourself. Kids don’t do that. Kids tell you first reaction, absolutely what they’re thinking. I like to say the most honest survey we’ve ever done was with the kids. It was really enlightening to see how important that quality time with them is. We found that 6 in 10 kids say they’re upset when a parent has to cancel on them, which isn’t really a surprise. On top of that like this inability to disconnect from work when they’re supposed to be off. 3 in 4 kids said, “My parent is unable to disconnect from work when they’re home or when they’re on vacation with me.” That is an eye-opener. Every time you might pick up your phone while your kids are eating dinner, I’d never thought about the message that might send to them. If you’re doing it on vacation when they’re supposed to have more of your attention, that’s not good. You don’t want your kid to brand you a work martyr. That was something we saw again and again because while kids are very forgiving, and they understand that kind of intrusion, they don’t forget it. We asked kids to detail the last time their parent missed a time off experience because of work. Every single kid had something for that verbatim. No one said, “You know, I’m not really sure.” There were some alarming things in there. There was the occasional school field trip and coming in to be a class helper or whatever. But some of it was like, “my dad missed Christmas.” That was intense. I mean we need to know that they are keeping score, even if they are being forgiven. That stuff is important. We want to make sure that they don’t lose out on those memories because a lot of kids’ earliest childhood memories are travel. That stuff really does matter. Right. What do you think happened between 1978 and 2013? Have you identified what happened that caused this shift? Everyone knows that when the economy is bad, we’re going to take less time off. I mean to a degree you see a sharper dip from 2008 to about 2014. But when you look at the overall trend line, it’s not buffeted by economic winds with the same intensity that you would imagine. Really what we’re seeing is from 2000 to 2014 a really steep drop-off that we have not even come close to recovering from. We’ve made some improvements, but they’re moderate. I mean from a travel industry perspective it’s great, just the movement we had in a single year between 2015 and 2016 was $37 billion in terms of impact. That’s a positive for the travel industry, but people might not be feeling that just yet. That steep dive we took, a lot of that is due to technology. We are so connected to the workplace; we don’t find the time to extract. It’s not even so much about working when you’re on vacation. I think it’s getting to the point of actually taking time off and being mindful of it. Studies show, every time you see that e-mail ping or hear that sound, there is an actual psychological and physical response to that. If you feel like you can’t take yourself away because you’re so connected all the time, the idea of booking a few days away becomes more and more foreign and more and more difficult. That said, a lot of this is our mindset. I don’t think that that’s the only thing that’s driving it. I mean they have phones in France too as far as I know. We’re not the only people afflicted with smartphones. But it goes back to this false image of what it means to be a hardworking Americans. Part of the reason we’re really working to dispel this is because it’s not good for people. This is a great moment in work culture because there’s so much more awareness of the whole person and how important it is to have someone who appreciates culture, and wants to work really hard for you. We obviously have a great vacation culture where I work now because if we didn’t that would be the worst, most off-brand thing ever. But at the same time, it’s one piece of something that really makes people value their workplace. I think that’s important. I have a team that would walk across fire if they were asked and that has tremendous value. We don’t have high turnover. We don’t deal with some of those things that I know are a struggle for a lot of different workplaces, and it’s because we really respect people in and out of the office. That’s going to create a loyal, hardworking team. Being out for a few days here and there, that’s not going to matter in the long run but the other stuff, building a strong culture absolutely will. I so agree. I’m glad you’re touching on this because it was a question I had in my mind because you’re right, the work culture really is shifting. I remember when I was a young professional and just starting out, there was this track that you would start a career and you would just kind of build your career. It was pretty obvious as to where you were going next. Although, in my generation, that’s what you thought at the beginning, it all kind of changed. Now with the new workforce that’s coming in, the young professionals that are coming in, they seem to be much more like nomads, so much more mobile. They don’t stay in the positions as long. So there is this focus on work culture. I was curious as to how that impacts some of these research studies that you’re talking about. Then just to be a little bit more specific, so one of the things that business owners in my circles talk about is paid time off and the desire of the young professional to have more flexible work schedules. I’m wondering if you see any impact by that. Some companies have no paid time off policies; some have unlimited paid time off policies or those flexible work schedules. Do you look at any of that and see how that’s impacting this whole movement that you’re talking about? From what we’ve studied that’s not the case. We find that millennials are some of the worst work martyrs that we come across. Those people who feel like face time is really important. They’re worried about not showing enough dedication. They’re worried about being replaced. There’s a lot of insecurity. So for every story, you hear about an entitled millennial who takes everything they’re given and then some, our research is bearing out that there’s a lot of people who are concerned and feel like their position is not stable. I think you can understand that when you consider their economic conditions. So it’ll be interesting to see if that changes over time as they grow in confidence and tenure in the workforce. My guess is it will. Because when you look at things like connectivity while people are on vacation, how often are they checking in with work? What’s funny is it really, Gen X is almost just as bad as millennials. Millennials are a little bit worse, but Gen X is very close. Boomers are a little bit different, but even they are not spared of this idea. So when you look at all that, technology is an equal-opportunity offender when it comes to generations. So no one is really spared that noose. Making sure that we set reasonable boundaries becomes that much more important. I understand that people can’t always unplug totally. We find that about a quarter say that they do unplug. But 8 in 10 say they want the option to check in. So this idea of a digital detox vacation or wi-fi free locations, it could be a fun marketing hook, but it’s only going to appeal to a narrow set of the population. Most people, even if they don’t check in, still would like the option. That’s not really different from generation to generation, which is pretty interesting. I think it will be interesting to watch how people approach this in the future. Something else we’re seeing is the idea of a work-cation. This would be intentionally going somewhere to work a full day. So it’s like, “Okay, well I want to see Colorado, so I’m going out to Breckenridge, and I’ll spend two weeks out there but still work regular hours. I’m just going to explore it at night and on the weekends.” This is a relatively recent phenomenon. I think this is kind of our Brangelina idea of how to approach vacation and work at the same time. I mean for some people it might work. I think for a lot of people it probably doesn’t. But what’s interesting is a lot of people don’t want to do it. We asked about this in our most recent State of American Vacation Report that we do for Project: Time Off every year, and this was a new line of questioning. There was a definite generational skew to this. So millennials express a larger measure of interest. Gen X is somewhat interested, and for Boomers, it is a hard pass. I think that could be the beginning of a trend. In a way I hope not, because you want people to fully relax and immerse themselves and enjoy. On top of that, if they can enjoy where they are, be ambassadors for that place so that they can tell their friends they should visit it. I think that we’d like to see a little bit more of that quality experience. But this might be something that we see. This might be the beginning of a trend. With millennials feeling so concerned about being away from the office, maybe this is part of a solution for them. Because most people, when they look at how much time they’re spending actually traveling with the days they take off, it’s a little less than half. So they might take 15 days off, but they’re traveling with 7 or something like that. So we’d like to see them travel with a few more of those days. 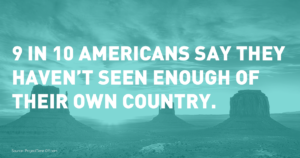 It might be a solution for people who also say, “I haven’t seen enough of my own country.” We saw 9 in 10 people say, “I haven’t seen enough of the US.” So inspiring a little bit of that, is work-cation a way to accommodate that? Again, I would say no because there’s still 52% of people leaving time on the table so there is vacation time available that we can take. But we see that there is keener interest in this idea of a work-cation with younger generations. Wow. That’s interesting. You’ve got the research, and you’re understanding what the real issues are. What are some of the things that Project: Time Off is doing or what are some of the initiatives that you’re working on to impact that? A lot of what we do is it’s a pure PR effort. We don’t have a marketing budget. We can’t push it out in that broad-based way. We do a few things. One, media relations. We try to get the word out that way with people who do have channels and audiences that we can’t afford. Then we also work with a number of mostly travel organizations who have taken the message, made it their own and put it out there. We’re a little bit unique. We’re a non-profit. We want people to take this and use it. We don’t care if we get credit. We don’t care if we’re cited. We just want the word out there. We do have a lot of tools on our website that people can take and use. We create social posts that are there for you to use. Or we’ve got this calendar feature for vacation planning. It is a really cool tool because you can enter the days you have to use. As you plot out your time on the calendar, it counts down so you know exactly how much time you have, so people can be more mindful in their planning. You can export it to your calendar, or you can send it to your loved ones or your boss or whatever. We also built it on an I-frame so anyone can take that and put it on their website. You can even change the colors to your brand colors. We just want people to take and use things because the only way we’re going to make a significant impact and change is if we have a lot of people saying the same thing. I always say my dream is to live in a world where if somebody says, “I don’t use all my vacation,” the automatic response is, “That’s crazy,” not, “Me neither.” That’s really what we’re trying to do. We’re going after this broad-sweeping change, and we can’t do it alone with just research. We need a lot of people singing from the same song sheet to make real change. How are you reaching employers? Or are you? Is that a piece of the puzzle for you? We’ve worked with a number of HR organizations. We’ll focus on publications that speak to that community. I wrote a piece for Harvard Business Review recently. We’ve worked with SHRM. We’ve worked with World At Work. We’re trying to get that message out there to them as well. We have a ton of resources aimed at managers, not just HR leaders, because it is a critical issue that retail level communication between manager and employee makes such a big difference. A lot of companies aren’t super small so if you hear something from the CEO it’s like, “Well that’s neat, but does it work for my team?” A lot of the culture is shaped at that level. It’s important to set the tone at the top. I don’t want to say that it’s not because it absolutely is. It creates this imperative for you to carry that forward. I’ll give you an example. Project: Time Off is part of the US Travel Association. US Travel has around 60 employees. When we looked at our own vacation staff about four years ago we found that only 19% of the staff were taking all their time off which is pretty terrible. Well below the national average. When you work for the US Travel Association and travel is right there in the title, that’s not the kind of thing you want to go out with. We decided to create a program to make this better. We did a $500 incentive for anyone who took all their vacation time which, right there, should inspire people. We also did an entire communications campaign around it. From the CEO who made it clear to all the managers that they are responsible and have to pay attention to this. They need to encourage their teams, set up reminders from the payroll people. “Okay, you have this many days at Memorial Day. You have this many days at Labor Day.” People were mindful of it throughout the year. We saw, in a single year, our usage go from 19% to 91%. The $500 doesn’t seem realistic for everyone, I get that, but we saved money. It cost us $26,000 to provide the incentive, but we saved $36,000 on what we call our vacation liability. That time that’s rolled over and has to be paid out when an employee leaves the company. That all went down. We couldn’t guarantee that. The next year when it came up again, some of the finance people said, “Well can we guarantee that it’ll save money again?” No, we can’t really predict how people will use it, or be sure that that the savings will again. To his credit, our CEO Roger Dow said, “Well I don’t care. Even if it doesn’t, I know what it did for our people. We had our best year. They were energized. People liked being here. It helped us land on best places to work lists. What that does for talent attraction and a stronger organization, I don’t need to quantify that to know that it worked.” So we’ve had it since and it’s been a really great tool. Also, everyone knows we’re really bought into vacation. So that’s hugely important. Absolutely. I think that that makes a huge difference. Not everyone could offer perhaps that $500 incentive. 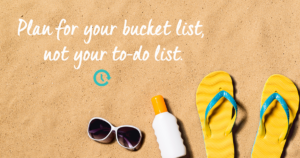 But some of those simple things like reminders from HR or from payroll saying, “You have this much vacation left,” or “You have this three-day weekend coming.” Those reminders make a big difference. Absolutely. I always said we should have done a placebo exercise the first year and just done the communication to see the movement. We probably wouldn’t have gotten 91%, but I bet we could have gotten to about 50 percent just with communication. Well, that’s really great. I also wanted to back up to another thing you were talking about earlier: the managers or the leadership as role models. In your research have you seen a difference regarding level within an organization regarding how they take their vacation? Like would the CEO perhaps maybe not take as much as someone who’s more entry-level or is it not like that, is it not dispersed that way? It is exactly like that. Okay. Unfortunately, that’s part of the problem. We see more positivity around vacation in the company culture at the top, but we see less activity. It’s very, “Do as I say and not as I do” and that’s a big problem. Even if you’re saying all the right things, if you’re not going and doing them yourself, you’re creating a different culture right there. You need to make sure that your verbal and non-verbal cues are lining up. I think there was this story about Jim Moffatt who’s the CEO of Deloitte Consulting. He was going on vacation and wrote an e-mail to his team saying, enjoy Labor Day or whatever it was, but there are important things to be one while I’m away. One of his trusted friends responded to the e-mail and said, “What are you doing? You’ve got to trust your people.” It completely changed his thinking. Basically, he said, you know what? If you can’t trust the people you hired to do the job you hired them to do while you’re away, then you have a much bigger problem than vacation. There’s a lot of truth to that. The reason they do it though is to make sure their employees are cross-trained. If they find that someone can’t step in for the vacationing person, that’s a point of failure for their company. They never want to have someone who is the only person who can do something. It doesn’t diminish the value of anyone who works there. It’s just a way to make sure that they feel comfortable working within their vacation policy and that they’ve got a smart company that’s operating well. But that is revolutionary thinking for a lot of people. The idea of doing something like that seems so foreign when really, it’s good business. So she did. She took time off, but she had to stop and really be mindful of it and remember. It’s a different mindset from thinking you have to use those days by X or you lose them. What is your take on unlimited paid time off? What does the research say and how does that impact what you’re trying to accomplish? So I have a love/hate relationship with the idea, and I think it’s a little more hate than love. For the people who get it right it’s great, but for a lot of people, it’s really hard. It takes a lot of discipline to have a successful unlimited vacation program. I think that’s where it becomes, back to the fact that two-thirds of people hear nothing about a vacation in their office, and we have this culture of silence around it, unlimited vacation just takes that problem and exacerbates it if you don’t do it right. Our research shows this is still very rare, about two, maybe three percent of companies. While it’s up a little bit, we’re talking about a small number of companies offering this. It’s much more common in Silicon Valley and “innovative” companies. Most companies offer this with the right spirit. We don’t work a nine to five schedule anymore. You deserve flexibility. Unlimited vacation helps provide that flexibility. I think that makes a lot of sense and comes from the right place. The flip side is, if you’re not paying attention to it then that’s where we usually see some problems. I would suggest, if anyone is thinking about unlimited vacation, continue tracking it after you make that shift because you need to know if it’s working or not. You need to know if people are still taking time. Because what we find, and this is more anecdotal because there aren’t that many companies that offer it, people tend to take the same amount of time or less than they had under their previous structure. People like boundaries. People want to know the rules of the road. That’s kind of the trouble that we see when it comes to unlimited vacation. If they don’t know the speed limit they’re going to hit the brakes, because they don’t want to be wrong. They don’t want to get a ticket. That’s where that communication becomes essential. Netflix is kind of the pioneer of unlimited vacation. They were one of the first out there. It’s not just because they have a start-up culture and that’s just who they are. Part of it was because they were going public. When they were going through the process, their auditors freaked out because they weren’t tracking vacation. They said, “Well we don’t want to do that. How do we get around that?” An unlimited vacation policy was the answer. But they didn’t just stop there. They built this culture of what they call freedom and responsibility, so it’s central to everything that they do, not just vacation. I think that’s where it really can be successful if it’s part of your culture and it’s part of who you are as a company. Their CEO is also out there saying, “I take six weeks of vacation.” That gives you those cues and gives people some expectations. A lot of companies with unlimited vacation have minimums. HubSpot has a minimum, and they have unlimited vacation. I believe Motley Fool also has minimums. So that’s another way of approach it. But the most important thing is, especially at the outset, you’re still tracking it, you’re still paying attention. Because if there are departments or areas that aren’t taking any vacation or very little, then that’s probably a trouble spot for more than one reason for the reasons we’ve talked about before. All the cultural issues, the retention issues, the engagement issues that you’re going to experience, all of that ties very directly. I think in a way tracking it could identify some potential problems that you might not see otherwise. On top of that, you can track whether it is working or it’s not. Kickstarter is a company that went to unlimited vacation because they thought, “Oh, well that’s kind of what companies like us do. We should do that too.” They found it backfired completely. People were taking less time, and that was not their objective. Their objective was to provide a more flexible work environment. So they ended up reverting to their policy of set days because it worked better for them. And by tracking it the found out that that worked better for them. It can be great. It can be terrible. It can be somewhere in between. But making sure that you’re aware and communication and paying attention is really going be the success or failure point. Yeah. That’s great. That’s great advice. Thank you. I think we’ll adopt some of those points as well. Great. One workplace at a time. That’s why I love doing this podcast; I learn so much all the time. I do want to be respectful of your time and our listeners’ time, but before we say goodbye, you had mentioned a change in impact from 2015 to 2016 regarding the numbers of people that took their vacation as being 37 billion dollars. What is the whole of it? Can you put some dollars and cents around just what we’re talking about? You’ve talked about how about 50% leave vacation on the table. What are some of that kind of numbers that really show what this means? Not just everything we’ve talked about in terms of health and wellbeing but real dollars. It’s absolutely real dollars, and it’s almost entirely realized by the travel industry, so definitely the most engaged group out there should be the travel industry. It varies a little bit year over year but those incremental changes in the average days taken can drive those year over year gains. When you look at the universe of time off, we’re in the neighborhood of around 600 million days going unused every single year – which is a crazy number. If you put that into years – sometimes it’s one of those big numbers that’s so big you can’t wrap your head around it – that’s 1.8 million years of time that we give up every year. If you go back in history 1.8 million years, it’s the era of homoerectus. It’s before humans even existed. Just to put into context how much time we leave on the table every single year. That time has a more than $200 billion in economic impact. So there is a massive opportunity out there. We can see that as a massive loss for the economy, or we can see it as a massive opportunity. Like a job opportunity, a million plus jobs, all the things that come with that massive opportunity. So there’s really no reason we should be avoiding this. We also do the calculation for states, so if you want to know numbers for your state, we have an interactive map on our site that you can look at and all sorts of other resources. We just redid our website. It’s brand new, shiny, fancy, lots of stuff for the travel industry. We aim to get people to understand the problem and help us solve it. That’s really what we need. We need a lot of hands to solve this because it’s going to be a big win, certainly for travel, but for families and for workplaces. There’s really no losers when people take their time off. There are only winners and that’s what we’re trying to accomplish. Yeah. That’s awesome. You’re right. There are only winners with Project: Time Off and taking that time off. I really appreciate you being with me today, Katie. I learned so much. I know our listeners also have learned a lot. I hope that not only will you have motivated myself and my team to be more mindful in the time that we take off but also our listeners and their team members as well. Thank you so much for being here. We’ll look forward to checking in with you again some time. Alright. Thank you. I appreciate the time. Get out there and take your vacation!